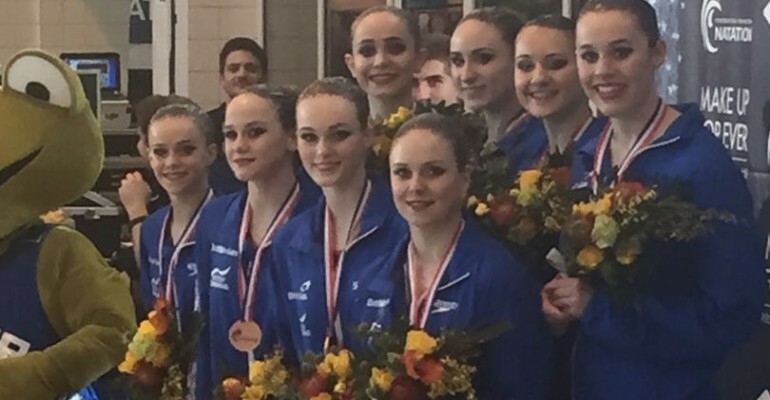 The British Synchronised Swimming Team are continuing their preparation for the Olympic qualifier and the LEN European Aquatics Championships by competing at the French Open last weekend. The team included GLL Sport Foundation supported athletes Emma Critchley and Hannah Randall who played a vital part in securing a bronze medal and a fourth place. Hannah Randall, who was competing in her first senior international Solo final, finished in eighth place overall with an impressive total score of 74.3333. The team, including Randall and Critchley finished in fourth place overall in the Technical Routine with a score of 74.6490 and competed again on the last day of competition in the Free Team. The 8-strong Team competing in the Free Routine consisted of Isabelle Thorpe, Hannah Randall, Phoebe Bradley-Smith, Danielle Cooper, Jorja Brown, Emma Critchley, Kate Shortman and Zoe James and stepped up to show their progress in one of their first senior international competitions together to win a bronze medal. Congratulations to the GB teams, especially GLL Sport Foundation supported athletes Emma Critchley and Hannah Randall who have done us proud! Good luck to them both in the upcoming competitions.